Devyani International Limited, incorporated in 1991, is the largest franchisee for Pizza Hut, KFC and Costa Coffee in India. Pizza Hut and KFC are part of the Yum! Restaurants based out of Kentucky in the US while Costa Coffee is a British multinational coffeehouse company. Apart from the above, the company operates the brands Vaango, the Food Street, Foodie’s Bar and Swensens under its name. It is a part of the RJ Corporation which is the largest bottler for Pepsico in India and also operates other brands like Cream Bell, Delhi Public Schools, Park View City, Cyrobanks India among others. The company has 30% stake in Devyani International. Devyani International currently has presence across India, Nepal and Nigeria. As per their website, it has a visibility of more than 500 outlets of Pizza Hut, KFC, Costa, Vaango and the rest. In FY 14-15 alone, the company opened 114 new outlets across brands. (source: Director’s report). The company reported a revenue of INR 794 crores in FY 14-15, which grew 14% over the previous fiscal. However, the losses surged 68% year-on-year and as per the company’s Director’s Report “despite 14% increase in Sales and other Income, margins continued to be under pressure due to inflationary market conditions and challenges on Same Stores Sales Growth due to subdued consumer sentiment”. In comparison, Jubilant Foodworks Limited, which is the exclusive franchisee for Domino’s Pizza brand in India, Nepal, Bangladesh and India, reported an ‘Income from operations’ of INR 2,093 crores with a Net Profit of INR 111 crores in FY 14-15. Jubilant operates 959 Domino’s Pizza restaurants (as of November 5, 2015) and 67 Dunkin’ Donuts restaurants in India. 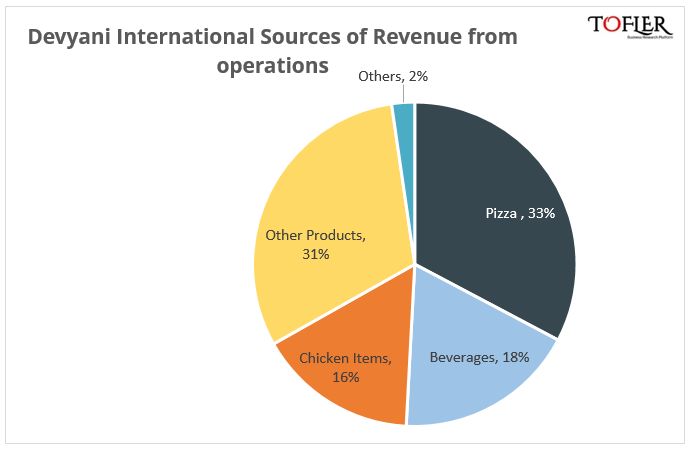 Their website quotes the ‘Euro Monitor Consumer Food Service Report, 2015’ to claim that they hold about 72% market share in the organized pizza market in India. Jubilant has been listed on the Indian bourses since 2010. 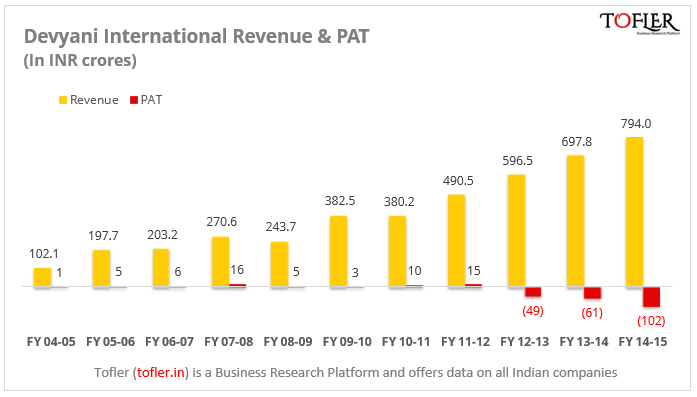 How does Devyani International make money? 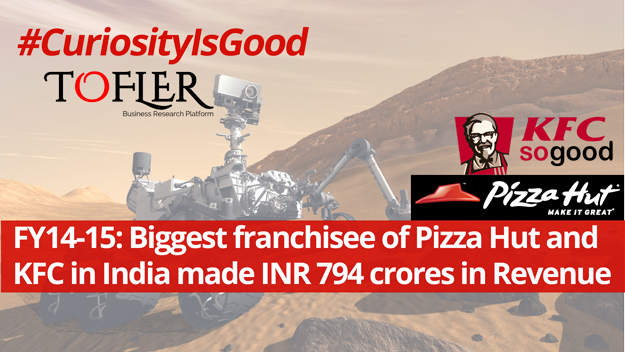 The biggest source of income was Pizza Hut which contributed 33% to the company’s turnover. Pizza Hut outlets operate in three formats: EDI (Enhanced Dine In) for fine dine experience, PHD (Pizza Hut Delivery) and RBD (Restaurant Based Delivery), which provides the options of Dine-in, carry out and delivery. KFC, which is the world leader in Chicken quick service restaurant, earned revenue of INR 126 crores. Combined together, there are more than 100 outlets of Pizza Hut and KFC operated by Devyani International in India. Costa Coffee contributed INR 142 crores to the company’s turnover. Costa Coffee entered India in 2005 has more than 90 outlets across India. The other brands contributed around INR 243 crores. The turnover of the international subsidiaries, in Nepal and Nigeria, stood at INR 18 crores and INR 90 crores, respectively. Only the Nepalese subsidiary was profitable. Interestingly, the cost of the material consumed, which includes chicken products, cheese, flour, beverage, oil, etc., was INR 249 crores. Out of this 99.7% was indigenous raw material and rest was imported. The outlets are present across shopping malls, airports, hospitals, business hubs and highways, and the rent paid towards the same was INR 130 crores. The royalty Devyani International paid to the international brand owners was INR 50 crores. The latest funding received by the company was in October-December, when Dunearn Investments invested INR 400 crores in the company. In a fast food market estimated to be about INR 7000 crores in 2016, they still have a long way before they catch up with Jubilant.